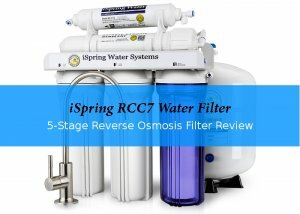 Trying to decide for a budget under sink reverse osmosis water filter? Read my review of the Watts Premier RO-Pure and how it compares to similar priced systems. How much water does the Watts RO-Pure system waste? 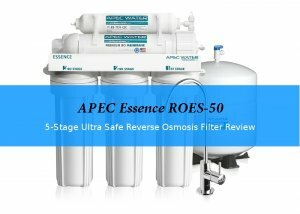 What does Watts Premier RO-Pure Reverse Osmosis Filter Remove? 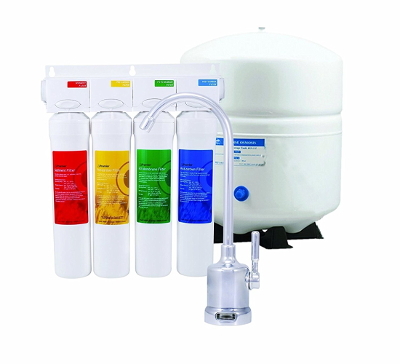 The Watts Premier RO Pure is a compact reverse osmosis system for smaller households. Let's start with some basic data. As you can see the initial price is relatively low and replacement filters also don't cost and arm and a leg. The Watts RO-Pure comes with an air gap faucet, available in various finishes. What makes this faucet special, is the integrated filter change indicator. With this feature, you don't have to rely on filter change interval recommendations alone, you now have an electronic tool to help you. A feature not typically included in budget reverse osmosis systems. You probably already know, that all RO filters waste some water. The difference is in the amount that goes down the drain as waste. And this system limits it to a reasonable amount. For every gallon of clean water, the Watts Premier RO Pure needs 4 gallons you can not drink. Although this does not sound so bad, it adds up over time. Similar priced RO models have a lower waste water rate. On the other hand, replacement filter are quite cheap, so owning this system could still make sense financially. Fortunately all replacement filters are available individually as well as in money-saving packs. A two years supply of all filters - including a new membrane - will set you back around $109. That is quite reasonable for a 4-stage reverse osmosis filtration system. Contrary to some other models, the filters do not have a separate housing. That makes the yearly cleaning and sanitizing of the system a lot easier. And all filter come with new o-rings. You don't need to order them separately. How long the filters really last depends a lot on your tap water conditions. Watts recommends regular filter changes every 6 months for both pre-filters and every 12 month for the post filter. The membrane should be good for two to five years. Please keep in mind, that the pre- and post-filters are an essential part of the system. They are responsible for the reduction of all organic contaminants. Unlike the RO membrane, where impurities are flushed out, contaminants build up inside the filter media. And sooner or later they are "full" and don't work properly anymore. Here is a list of some contaminants, the Watts Premier RO-Pure removes from your water. These reduction rates are quite typical for reverse osmosis filters and sufficient for most people. You won't find much better removal rates in other budget 4-stage reverse osmosis filters. This 4-stage RO water filtration system comes complete with all necessary filters, membrane, a designer air-gap faucet, tank, drain saddle and an Adapt-A-Valve™. The only thing missing is a drain adapter for sinks with garbage disposal. It's compact size fits even smaller kitchens. All filters have an auto shut-off mechanism for easier change. This saves your the tedious task of re-pressurizing the system after a filter change. Stage 1 of this filter is a 5 Micron sediment filter. This filter collects particles bigger than 5 micron and sediment. If your water is not particularly full of sediment, it is good for 1350 gallons. After six months, you should change it anyway. The second stage is a 5 micron carbon block filter responsible for the chlorine reduction. Chlorine could damage the next stage, the membrane. So a filter change every 6 months is advisable. The 50 GPD membrane rejects all the contaminants other RO membranes also hold back. See the list above. A compact steel tank holds the cleaned water until you use it. The small size can be an advantage if you have limited space. Other systems have bigger tanks. They take up more space, but also provide more clean water on demand. There is always a chance, that water staying in the tank for time tastes off. This post filter cleans the water again to protect you from bad smell and odor. Let's recap, and compare the advantages and disadvantages of this filtration system. Replacement filters are relatively cheap. An air gap faucet is part of the system. This filter system is certified. The electronic filter change monitor indicates when it is time to replace. The tank is a bit small. A drain adapter for sinks with garbage disposal is not included. Premier is owned by Watts Water Technologies, Inc., a global player in water technology. The Premier headquarters are in Peoria, Arizona. Watts Premier water filters are designed and assembled in the USA, while the part come from various locations. Watts gives U.S. and Canadian customers a 1 year limited warranty on parts defective in workmanship. Filters, membrane and tank are not covered as usual. Customer support is available via a free phone number or you can contact them by email. This under sink reverse osmosis system is easier to install than many other similar systems. Watts Premier did a great job by color coding all tubing and parts, so you always know where pipe or filter are connected to. The written instructions are also a big help if this is the first RO system you install. Lots of images and clear instruction. If you already have a hole for the RO faucet, then you probably can install this easily. If not, some DIY skills are necessary to drill it. Maybe you get help for this part, especially if you want to drill a hole in a granite counter top. Here is a short video, showing you all installation steps involved. 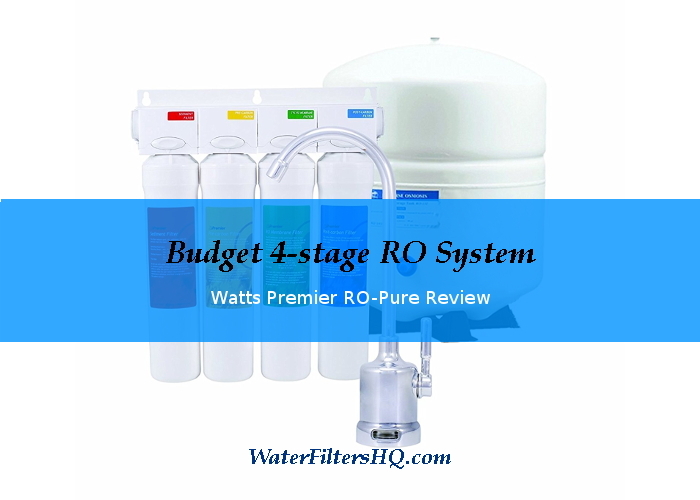 If you are looking for a budget reverse osmosis filter, the Watts Premier RO-Pure is a good choice. Especially, if you have limited space under your sink. The removal rates are good and regular filter maintenance is easier than with other systems. Only if you want a better waste water ratio, I would look elsewhere.